During the Edo period, tuna was not highly valued as a sushi topping and it was referred to as “Gezakana” meaning that it was inferior to normal fish. The reason was the big size of the tuna. At this time there was no ice, so tuna had to be salted. It was cut into blocks, salt was spread all over and in it, and that was it. At Uogashi (the market prior to Tsukiji) it was treated at shops that specialized in salting fish. The dark, discolored, salty chunks of flesh really were nothing but “Gezakana*”. 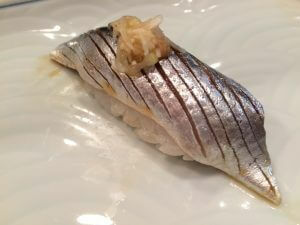 *Gezakana －Relatively low-cost sushi ingredients, such as gizzard shad and horse mackerel. 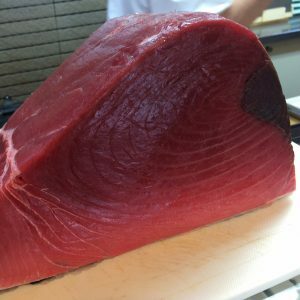 Bluefin tuna used to be also called gezakana in the Edo period, for losing its freshness easily. What makes a good sushi chef? 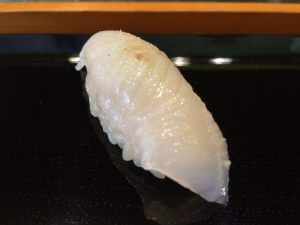 The balance between Shari (vinegar rice) and the topping is important in sushi. No matter how good the topping, the sushi won’t be good if the Shari isn’t right for it. More restaurants have been using red vinegar lately, but even if you use a Shari with a strong taste like red vinegar, the balance will be destroyed if the topping has a weaker flavor. Seasoning that goes well with various toppings that doesn’t stand out too much is ideal. It works the other way, too. If the Shari is too weak, the sushi won’t be delicious no matter how good the topping. Even if the topping is not premium quality, if the Shari is matched perfectly, the sushi will be perfect. In other words, a good sushi chef is someone who can make sushi with perfectly matching toppings and Shari. Posted on December 18, 2017 September 11, 2018 Categories TriviaTags Akazu, Edomae Shigoto, Nigiri sushi, Red vinegar, Sushi Ingredients, sushi recipies, White vinegarLeave a comment on What makes a good sushi chef? 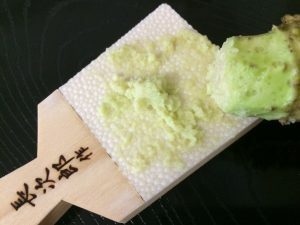 Why do some sushi toppings have ginger instead of wasabi? Ginger is used for toppings with a strong, distinct taste and strong fishy smell such as bonito, horse mackerel and sardines. Wasabi has a spicy taste and stimulates the senses of taste and smell and works to dull the senses so the fishy smell is not felt, but ginger is effective in actually extinguishing the fishy smell. Posted on December 11, 2017 September 11, 2018 Categories TriviaTags Nigiri sushi, Sushi Glossary, Sushi Ingredients, WasabiLeave a comment on Why do some sushi toppings have ginger instead of wasabi? Where should I grab the sushi when eating with chopsticks? Laying the chopsticks sideways as if scooping up the sushi distributes the strength and the sushi won’t break easily. If you grab it in the middle then there will be too much force on that part and it will break in two pieces. Make sure to eat this beautifully formed piece of sushi in one bite. Posted on December 4, 2017 September 11, 2018 Categories Basic KnowledgeTags Sushi etiquette, Table MannersLeave a comment on Where should I grab the sushi when eating with chopsticks?